John Cox is a performer who, for many, has slipped under the radar. Gifted as a song writer, John has five albums to his credit (in parenthesis below) and has produced many Christian songs of praise and hope for other performers over more than a decade. While seldom performing live elsewhere in recent years, John performs annually at the Cup ‘O Joy in Green Bay, Wisconsin. This year’s concert was not only rare but one of the best the audience will witness in 2010. Cox’s live performance pushes each song to new heights, making the song list always fresh from performance to performance. Bolstered by a band sharing fifteen year tenure, the set list includes jams with ‘unique changes’, all without missing a beat. Band members have varying backgrounds including many of the members making up Sonic Flood from 2000 through 2004 and now managing Zodlounge, a recording studio in Nashville, Tennessee. While Cox continues as a prolific Christian song writer, he also continues to hold a true connection to the audience while performing. Together, the band working as a single unit easily holds the ebb and flow of the concert through their shared experience. 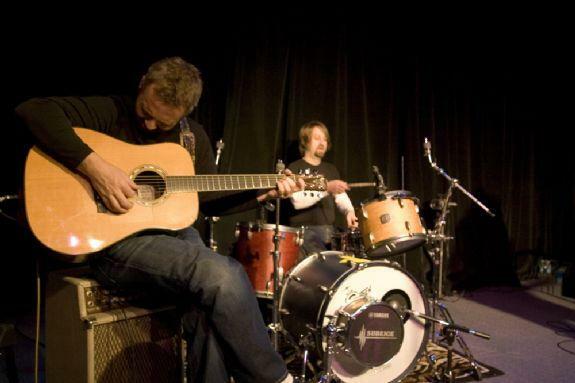 Band members include John Cox on lead vocals and acoustic guitar, Todd Shay on lead guitar, Tom Michael on bass and backing vocals, and Brett Vargason on drums and percussion. From ballads to rock, lyrics show deep personal expression. The lead electric guitar is ethereal, floating and full of song-to-song expressionism. The bass is solid, seamlessly moving in and out of the background. Drums and percussion spark and fire, rocking solid with a living beat. Watching the combined effort of the band song-to-song shows each member so involved in the music as to give more of themselves to the moment than most bands. The set list began with “Not as Brave”, an unrecorded gem, followed by “All You Need” (Sunny Day). New songs were introduced including “The Son You Always Wanted”, “You’re Gonna Make It” dedicated to his son, and “A Little Wild”, a new country rocker with a great acoustic / lead guitar intro feeding the song. John’s first radio hit “Sunny Day” (Sunny Day) continues to impress with consistency in performance time and again elongated in live performances to include a reggae break with guitar reverb underlying the lyric ‘pull me out of the wreckage’. The set included “With His Love” (Worth Dying For) and “You Are Loved” (All Is Forgiven), a ballad dedicated to his daughter. “Pull You Into My World” (80 Years) a song about a loved one suffering from substance abuse is highlighted by percussion and flowing guitar rising to soaring flight. “Beautiful Savior” (Sanctuary) is a pop rock song with great roving bass providing the foundation for floating guitar, acoustic rhythm and percussion elevating the song’s lyrics. “I Need You” (Sunny Day) and “Child Again” (80 years) capped the evening with Cox becoming so engrossed in the song that he held the guitar pick in his mouth while strumming his guitar, then continued singing without pause despite the pick remaining in his mouth! Band member’s solos end the song and the evening with Todd first on lead guitar giving great riffs, Tom with a jazzed bass solo, and Brett with a spirited drum / percussion mix. The evening leaves the audience drained from the performance’s emotions yet wanting more. Cox’s lyrics are story driven from personal experiences and are extremely well written Christian praise-rock. Clearly he is one of few who can write solid praise to a great pop rock beat without losing the lyric’s meaning. Faith is ever present and very strong in John’s music. And a seed was planted in every one of the audience’s heart that night.